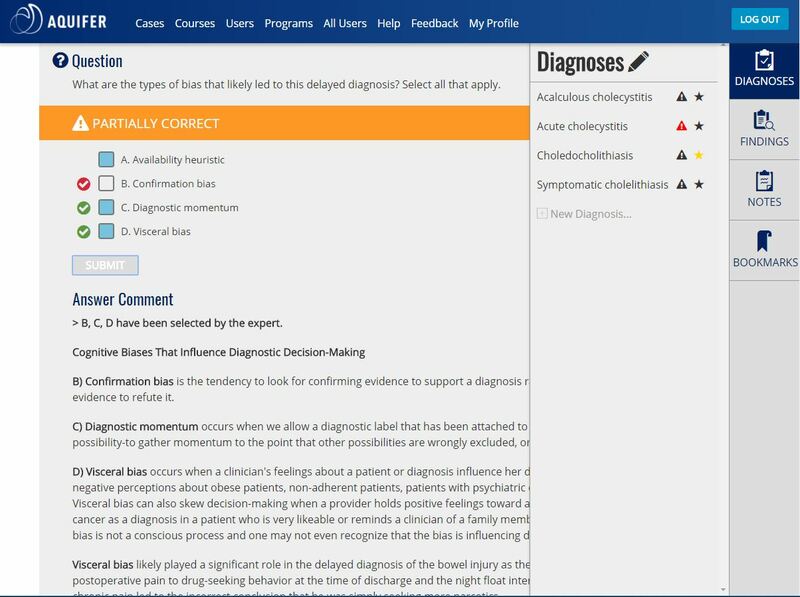 The six virtual patient cases in Aquifer Diagnostic Excellence introduce students to the cognitive processes and system-related issues that can lead to errors. Diagnostic accuracy is the foundation of safe, effective medicine—yet 15% of inpatient cases involve some degree of diagnostic error. 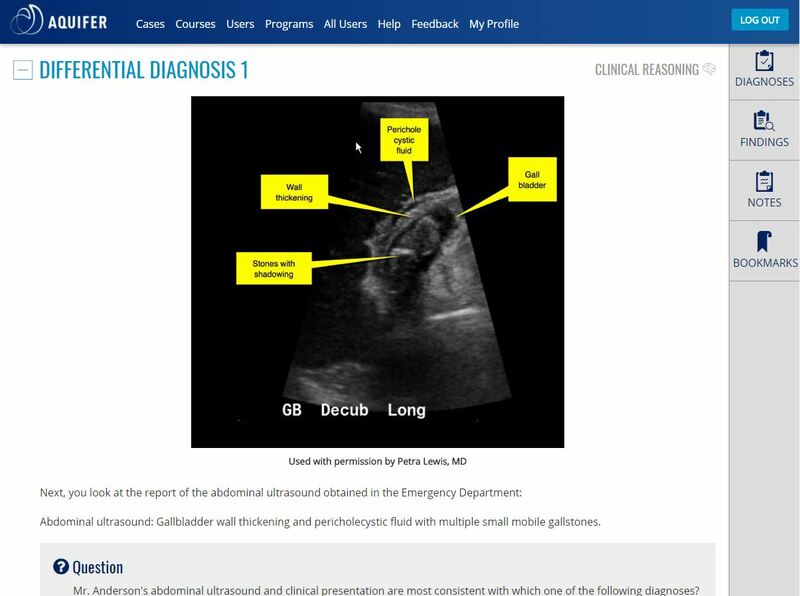 The six virtual patient cases in Aquifer Diagnostic Excellence introduce students to the cognitive processes and system-related issues that can lead to errors. Cases include foundational content about diagnosis, contributing factors, and strategies to avoid errors. 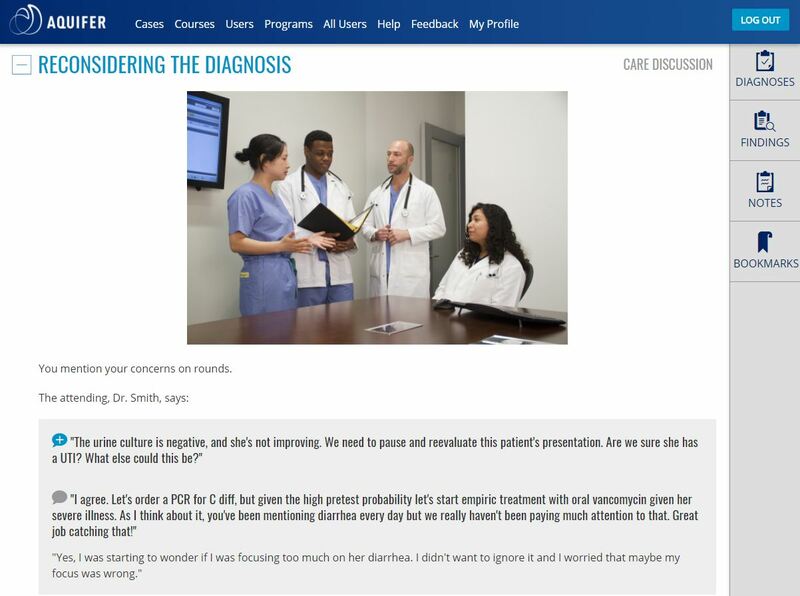 Causes and consequences of diagnostic errors for patients, families, and providers are discussed in detail and students are encouraged to reflect on their own experiences. Aquifer Diagnostic Excellence provides tools to help students mitigate diagnostic error. This cross-disciplinary course covers a range of topics, including internal medicine, surgery, gynecology, psychiatry, family medicine, and pediatrics. 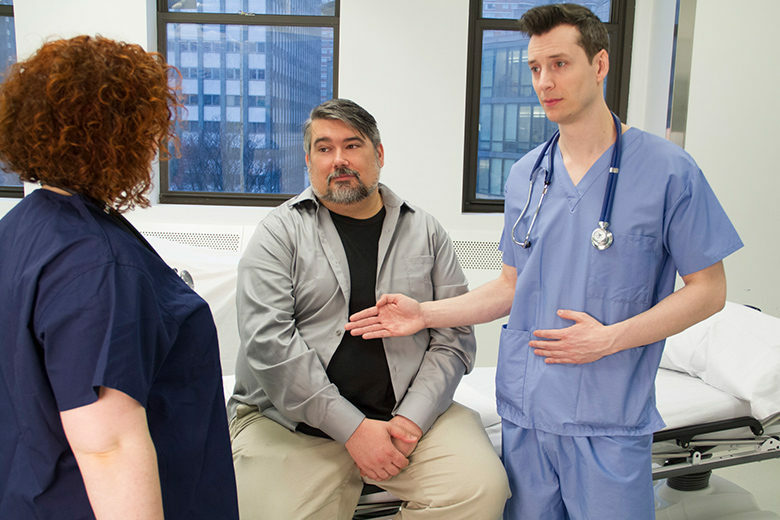 Clinical rotations are a key time to introduce students to the factors that underlie diagnostic error and to help them develop skills to mitigate errors. These cases can be easily integrated into health professions educational programs. Successful examples of integration include use in pre-clinical patient safety courses, implementation in longitudinal integrated clerkships, use in Capstone courses, and integration into traditional block curricula. With Aqueduct, it’s easy to combine these cases with another course to build a custom curriculum. Medical error is the third leading cause of death in the U.S., causing at least 250,000 deaths every year. 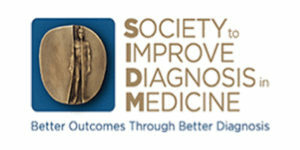 Diagnostic error represents anywhere from 40,000 to 80,000 of those deaths, making it the sixth leading cause of death.